"I rate Vulcan Tire Sales an A+ first class online company. The purchase was painless..."
Power King Tire prices starting at only $37 per tire! Use the drop-down boxes below to search for Power King Tires by size. Different rear tire size? Click here. ❔ Don't know your tire size? Click here to find it. All same size tires? Click here. ❔ Don't know your tire size? Click here to find it. 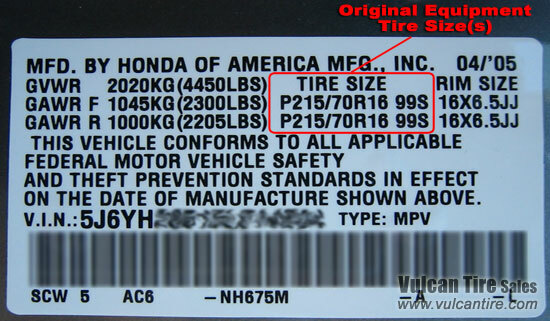 If you are unsure of your vehicle's tire size the best place to find this information is on the vehicle itself. Do not rely on websites or even your vehicle's owner's manual to determine your tire size. Modern vehicles offer many tire and wheel options so it is always best to check your vehicle itself to determine what tire you need. First, find your vehicle load and tire information placard. This placard is usually located on the door jamb of the driver's door. See an example of this placard in the picture below. Next, you will want to look for your tire size and service description on the tire itself. 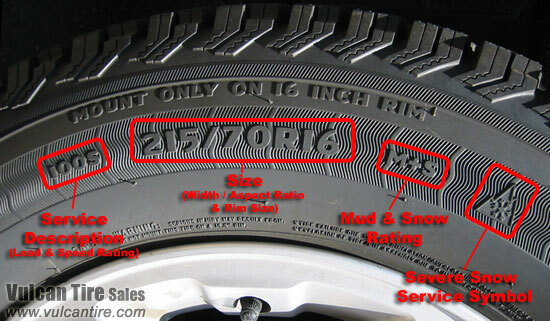 See the picture below for help on finding your tire size on your tire's sidewall. 1. Size The tire size is made up of three numbers. The first number is the tire "width" (listed in millimeters) followed by a "/"; second, is the "aspect ratio" (the sidewall height listed as a percentage of the width) followed by a "R"; then finally the rim size (rim diameter, listed in inches). When determining what tire you need all three of these numbers (width, aspect ratio and rim size) should match exactly. 2. Service Description The tire service description is made up of two parts. The first is a two or three digit number indicating the "load index" of the tire. This determines the weight the tire can carry. When replacing tires, you should select a tire with the same or higher load index than what is listed on the tire information placard (not necessarily what is listed on your current tires). Browse Power King Tires by type or style below.